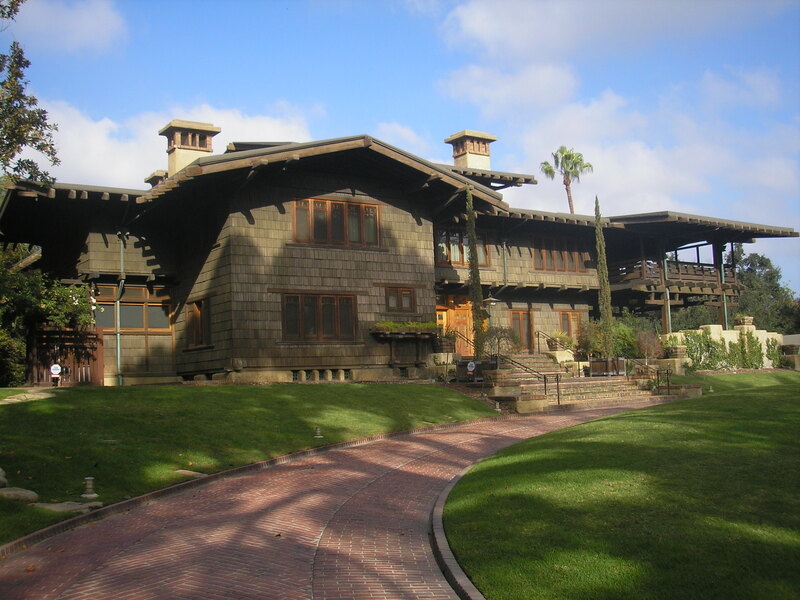 I’ve been to the Gamble house at least five times which includes the time I went with a class in the fall of 2012. 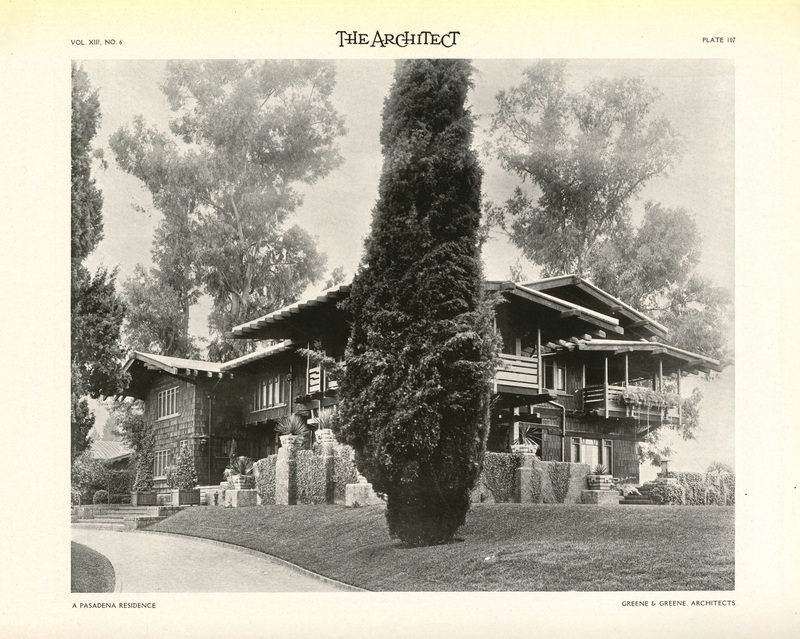 The class was called Architecture 444: Great Houses of Los Angeles. 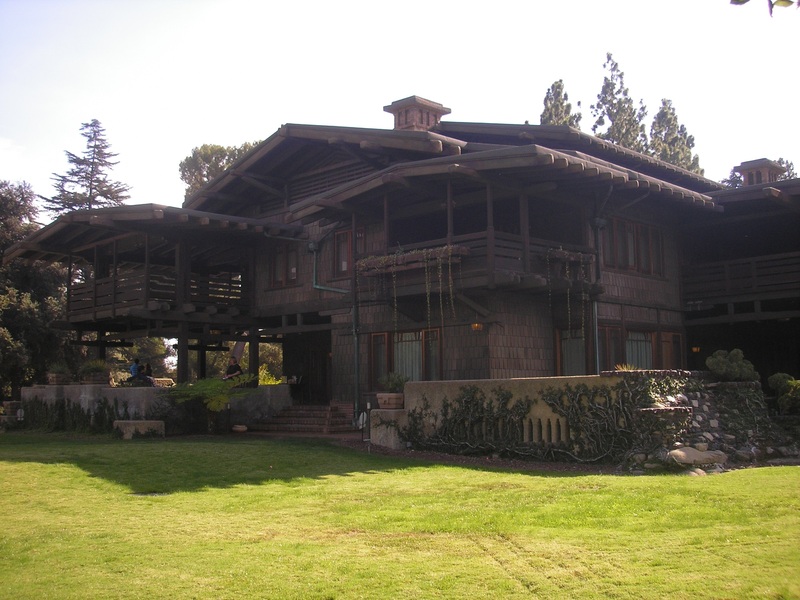 The Gamble House is wonderful yet I do find it slightly “fussy.” I doubt that I could live there (in the event that the house was handed over to me as a gift). 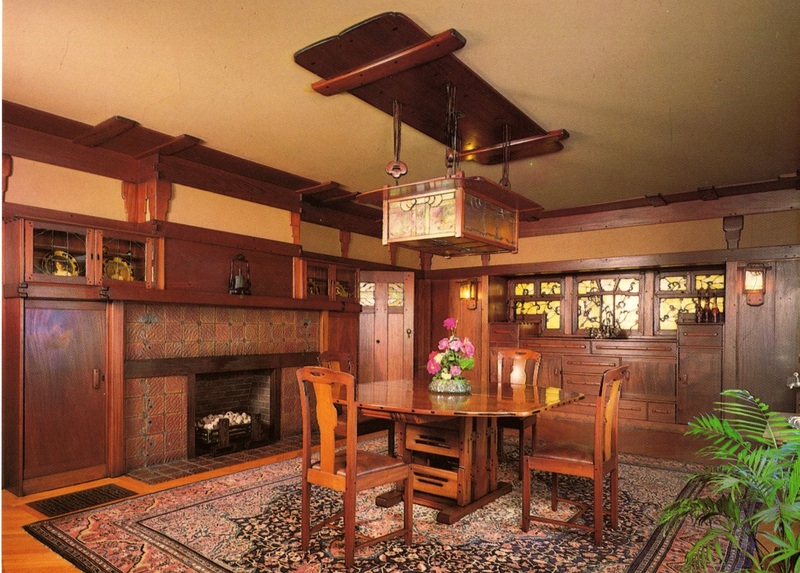 I would much rather live in the Bandini House which is another Greene and Greene house built in 1903. Unfortunately, that house was demolished years ago. 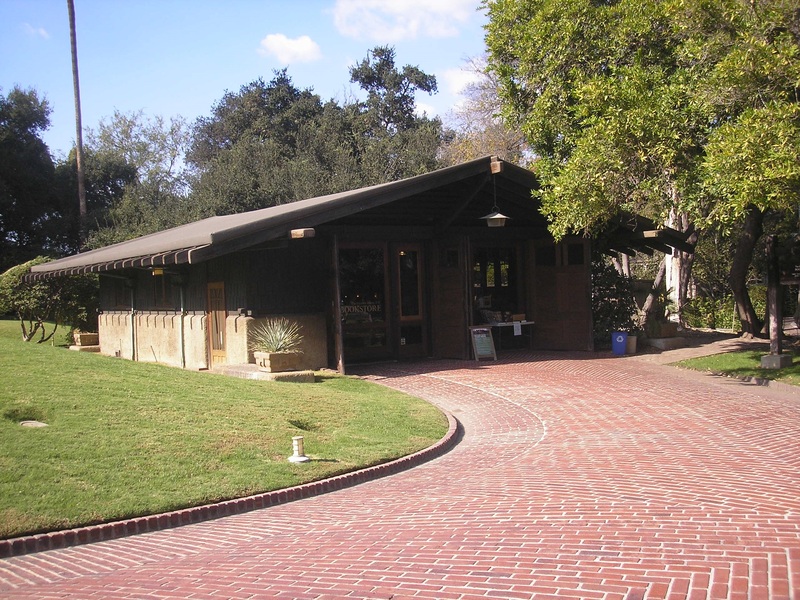 The Bandini House had a U-shape configuration and a patio inside the U. I really like the Bandini house because I can see myself riding a horse (or donkey!) into the patio area. Over the years, I’ve seen practically every book published on Greene and Greene. 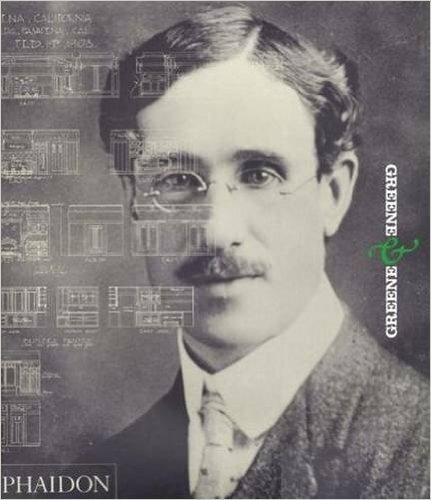 IMO the best book on these two architects is Greene and Greene by Edward R. Bosley from 2000. That book has lots of photos and readable, informative text. If you want a good overview of Greene and Greene, regarding both their practice and private lives, buy this book. It’s from Phaidon. It’s great! Buy it if you like Greene & Greene. 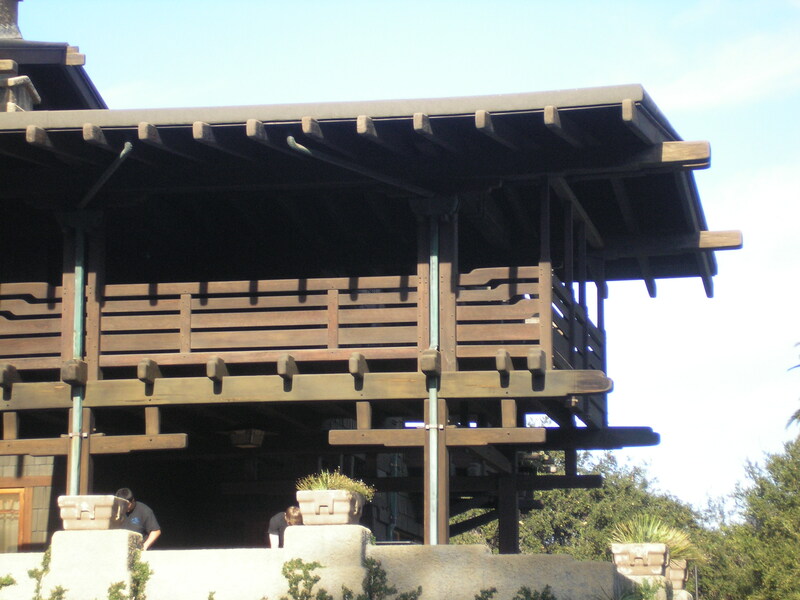 The Gamble House from the street. 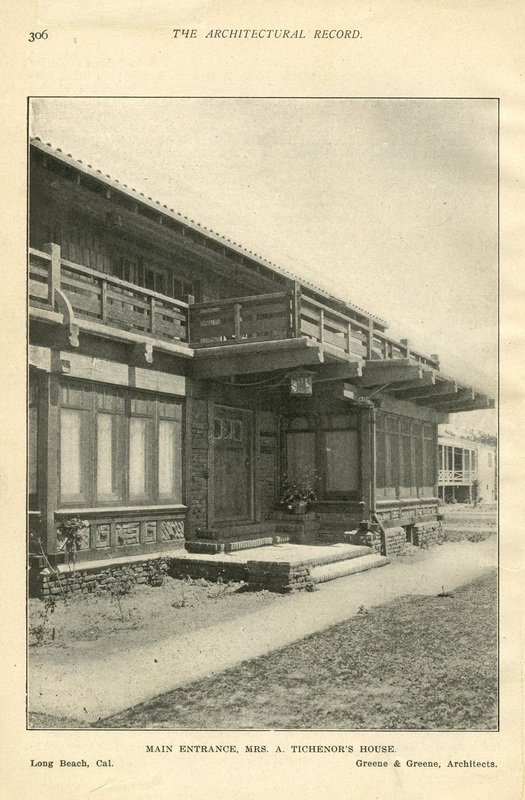 Here’s one of the sleeping porches and the decorative woodwork that surrounds it. 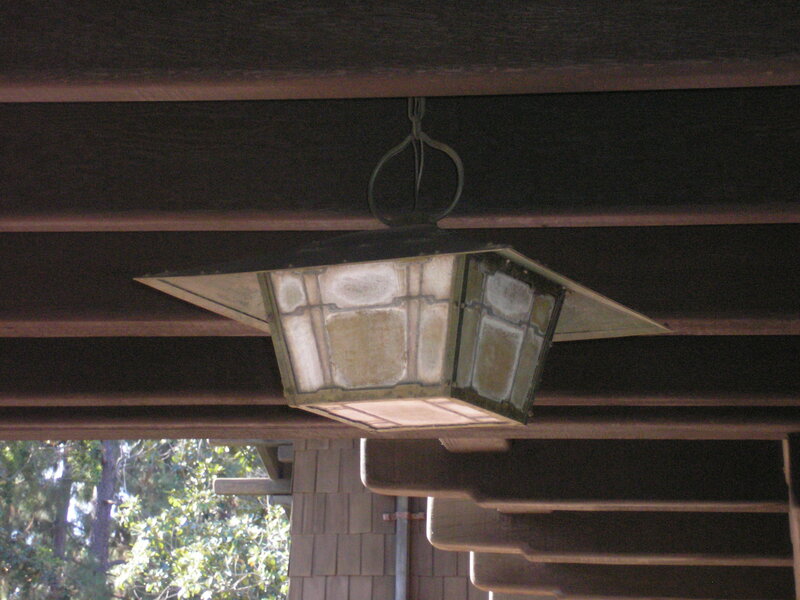 This is the light fixture hanging under the sleeping porch. 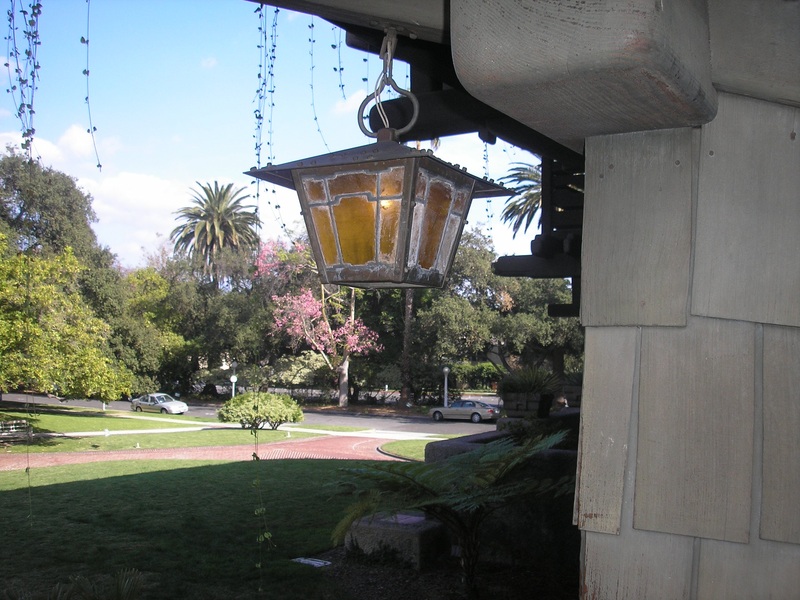 Right inside the front door hangs this latern. On the tour I took with my class we were told that the Gambles wanted a family crest so the Greenes created this crane image for them. The Gambles sound borderline pretentious. 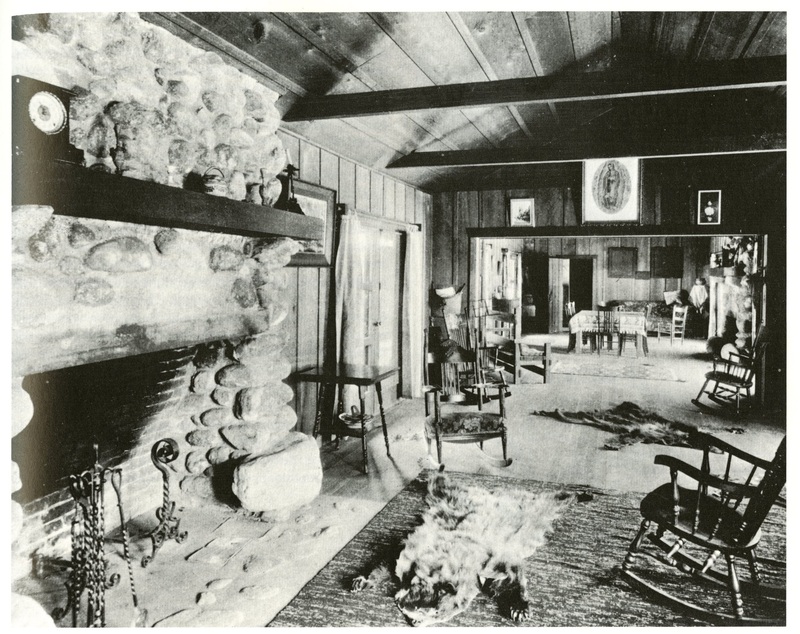 Interior view of the Gamble house from a postcard I bought while at the Gamble House. The photographer is Marvin Rand. 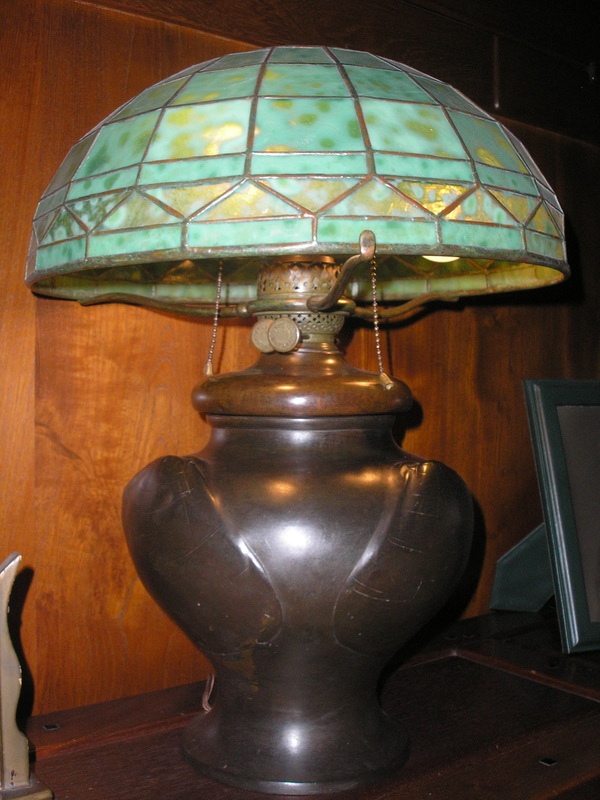 A lamp in the living room of the house. It was not made by Greene and Greene. 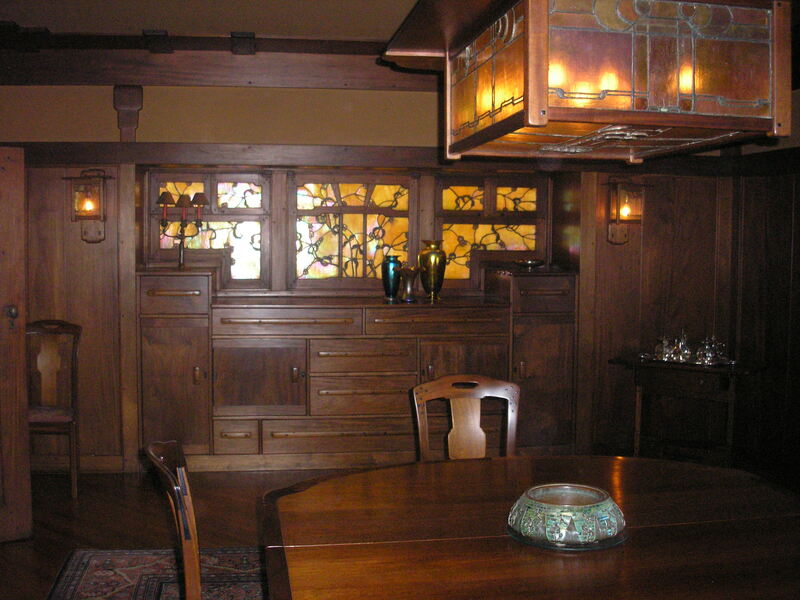 It was made by Tiffany Studios. 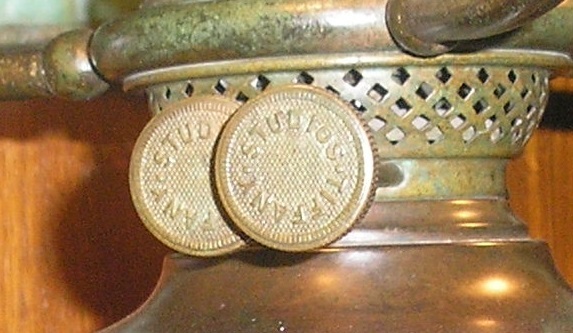 It says so on the circular knobs. Here’s a view of the dining room. 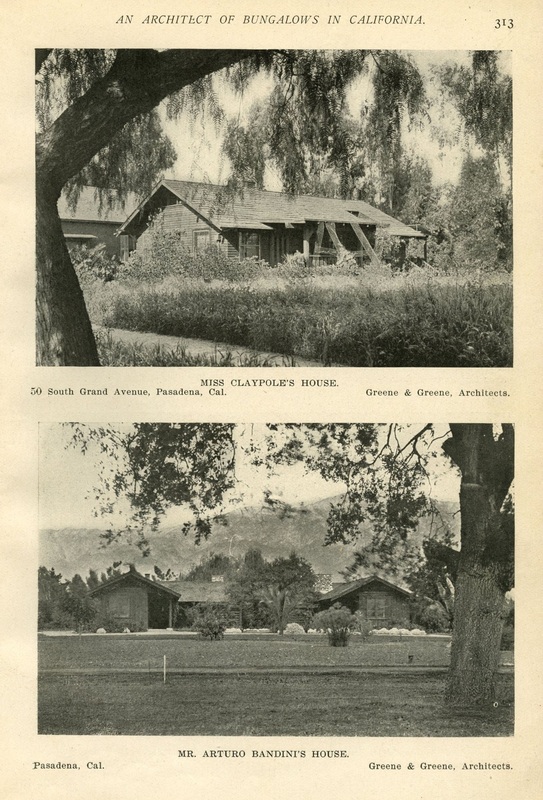 Another postcard photographed by Marvin Rand. A photograph I took of the dining room. 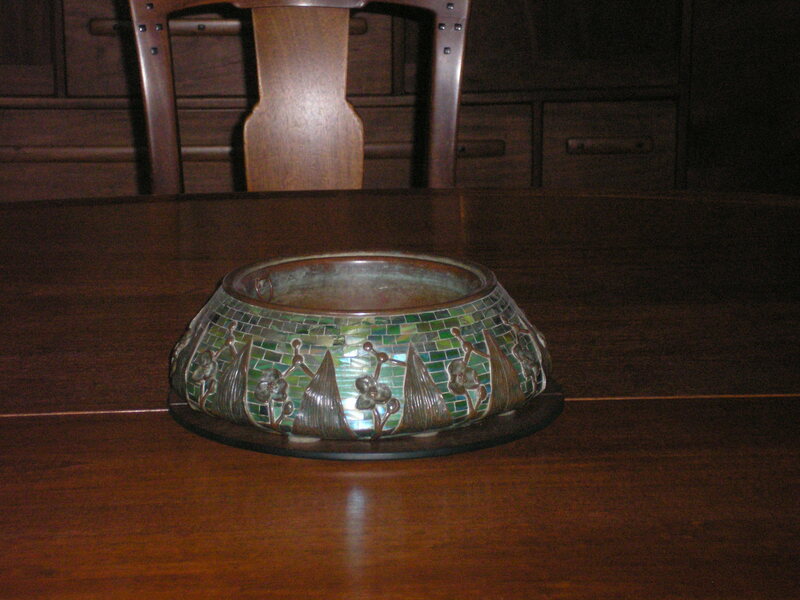 I like this bowl on the dining room table. 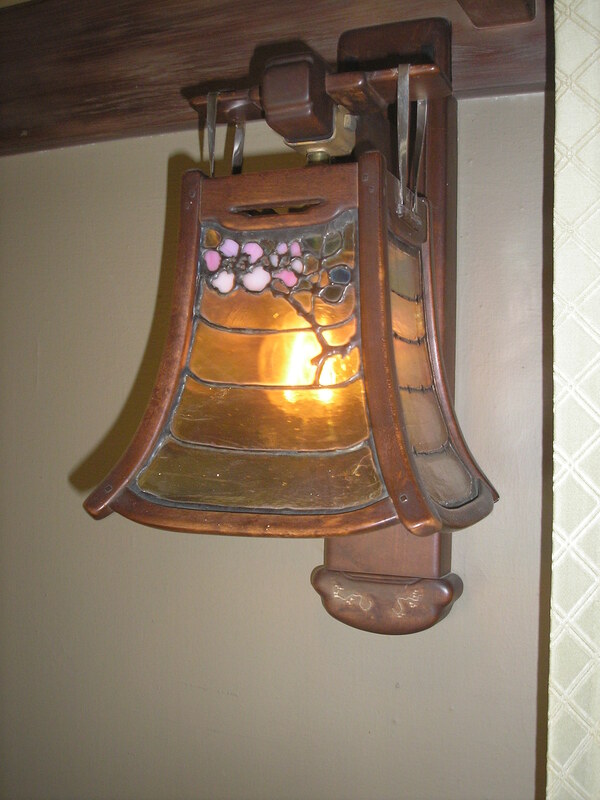 A sconce from the first floor bedroom which would be directly to the left upon entering the house. 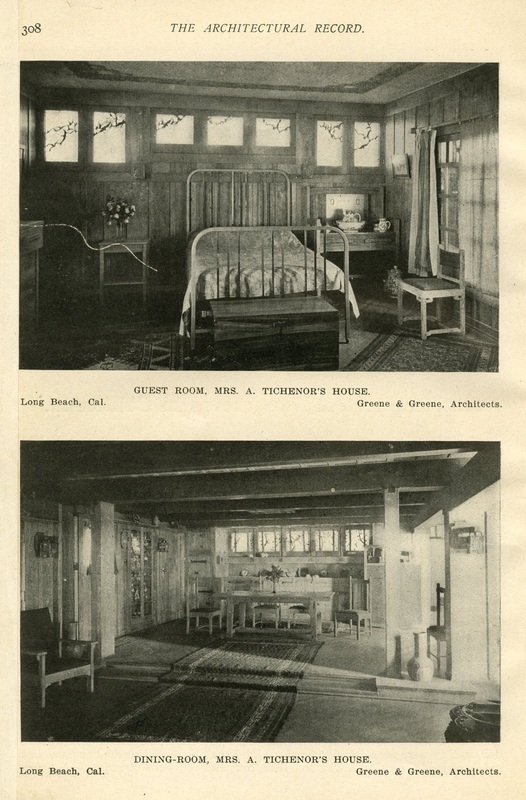 In this first floor bedroom (which was a guest bedroom) there were 2 single size beds with bed frames (made from metal) with a ribbon inlay. 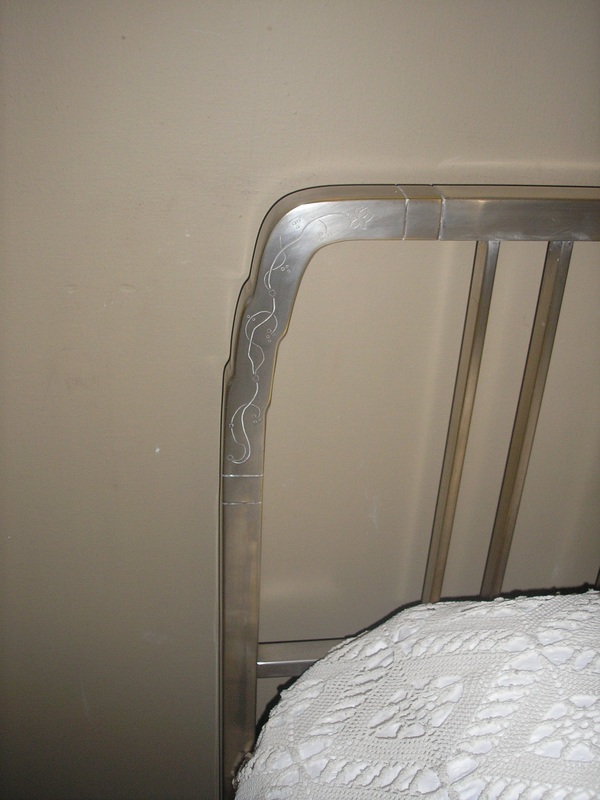 You don’t expect to see a metal bed frame in the Gamble House but there it is. 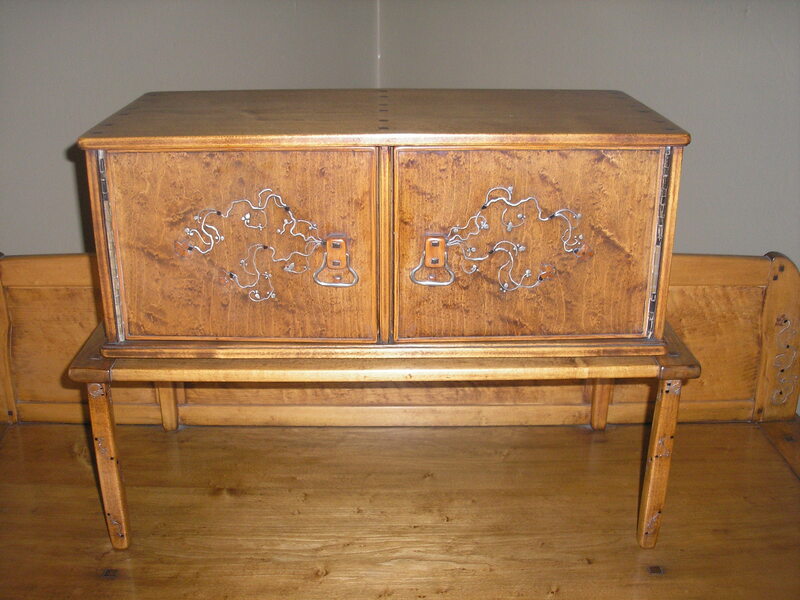 This small cabinet sits on the dresser in the same first floor bedroom that the sconce and the metal bed frames are in. I guess this cabinet could be used for hankies or jewelry. It was definitely made by Greene and Greene. 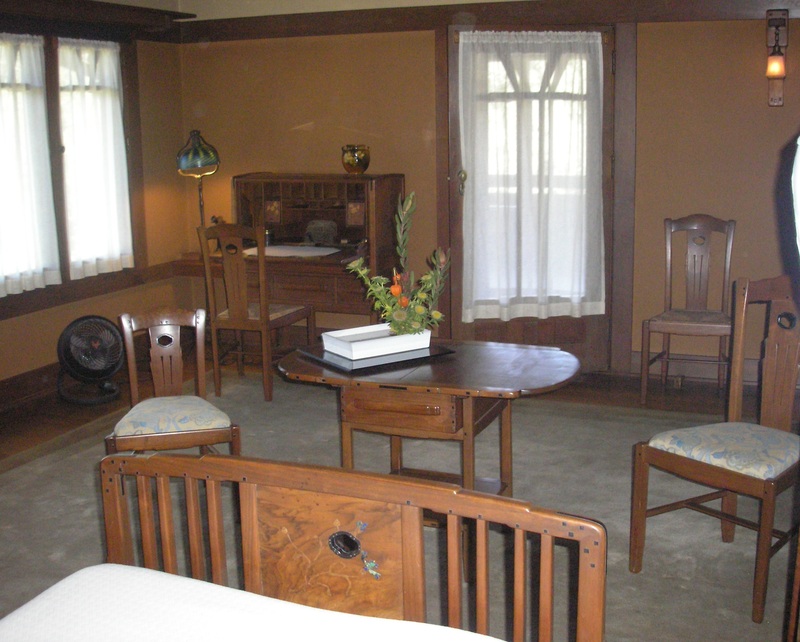 A second floor bedroom in the Gamble House. There’s room for lots of furniture. Four chairs? Not once in my life have I ever had four people in my bedroom but, then, I’m from Iowa. 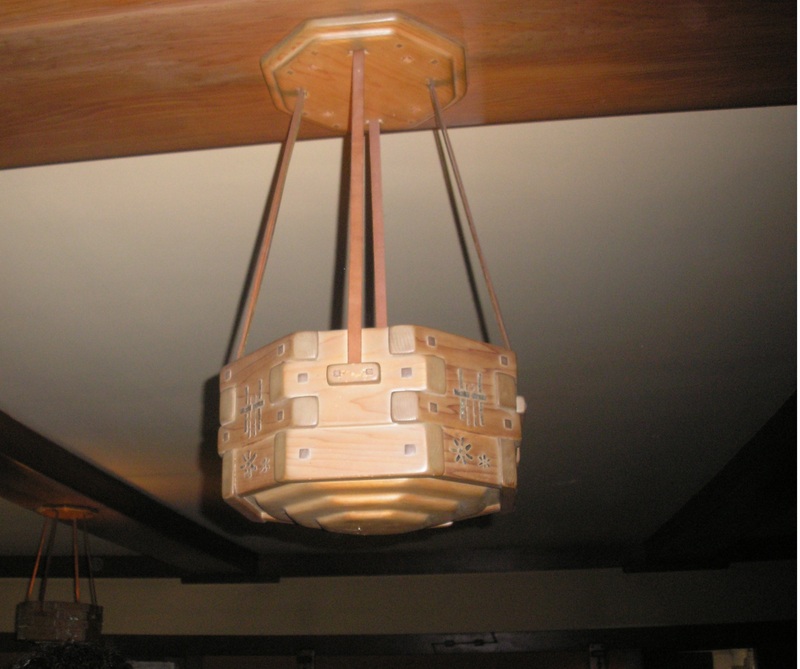 An unusual Japanese influenced hanging light fixture in this second story bedroom. This is a shot from the north side. 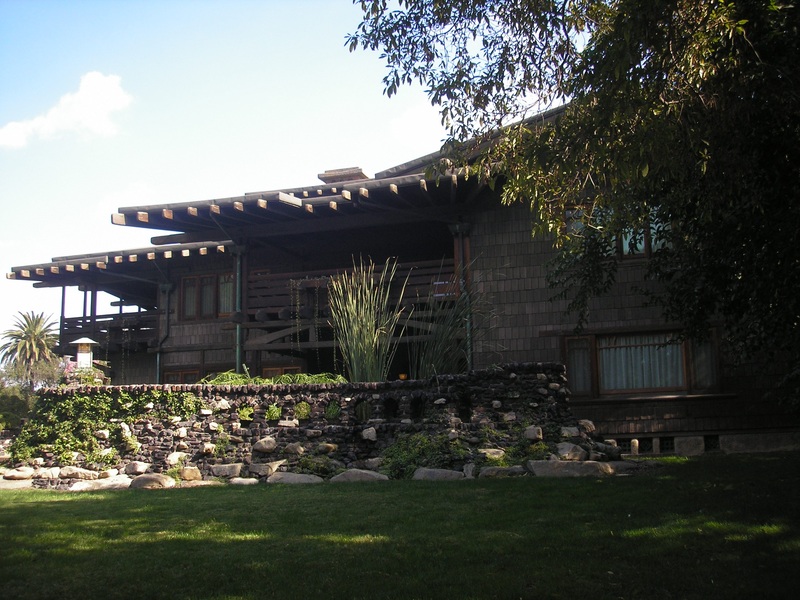 The house’s mass can be seen from this angle. The rear of the house. While the house is huge it has a rather small backyard. I’m at the edge of the lot taking this photo. One more step back and I would fall down the cliff and onto the road below. 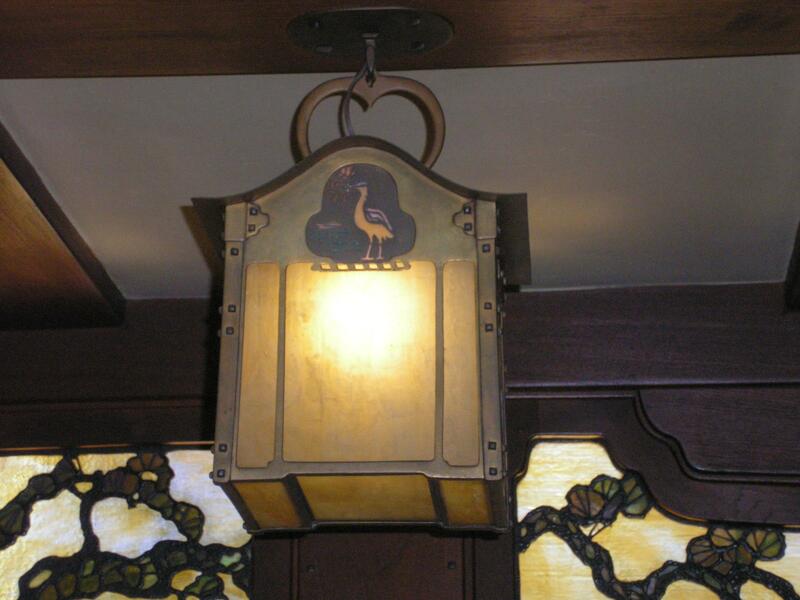 I like this lantern that hangs at the back of the house in the northwest corner. 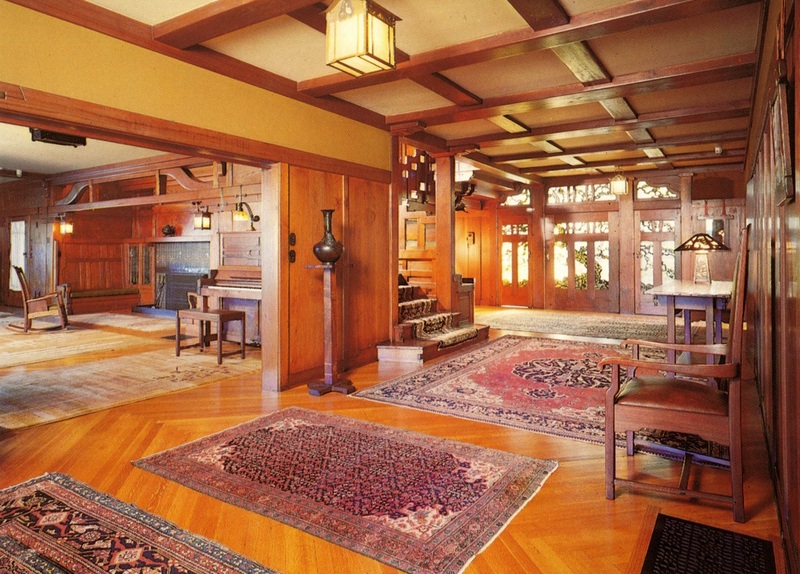 The first floor’s long, wide hallway leads to some French doors at the back of the house. When those doors are opened you see this. This is the garage. 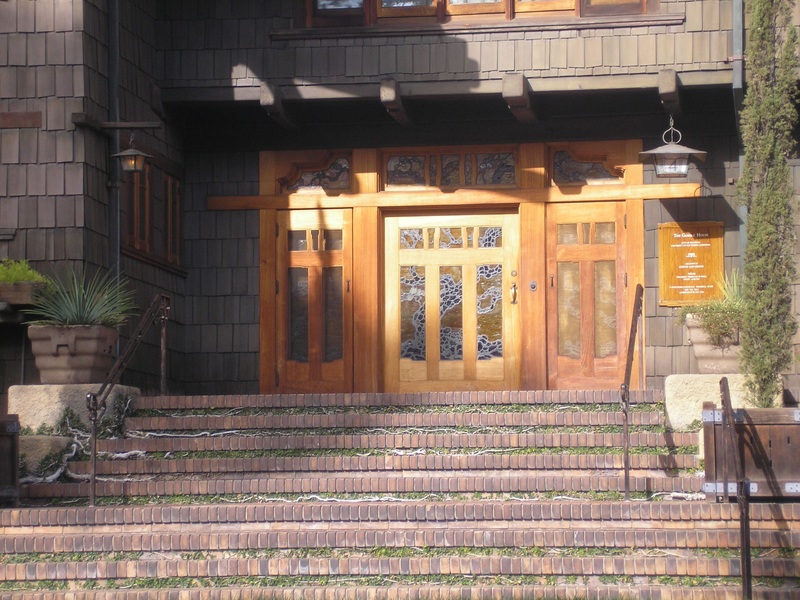 Now, it’s used as a bookstore for the house and a place to buy tickets for the tour. The bookstore has a zillion books and some nice pottery. It’s a great bookstore. At first I didn’t even know what Greene & Greene house this was. Whoever the photographer was, uh, he hated the Greene’s. This is the best angle the photographer could find? Wow. 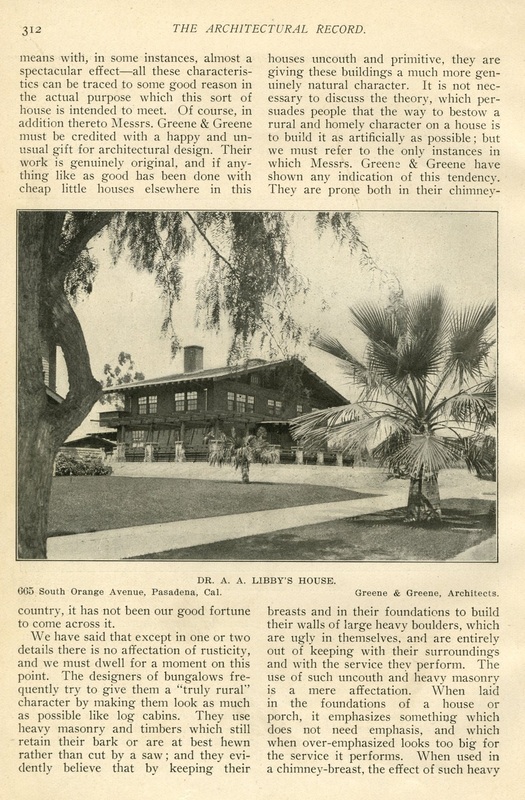 I found this in a publication from 1917 called The Architect. 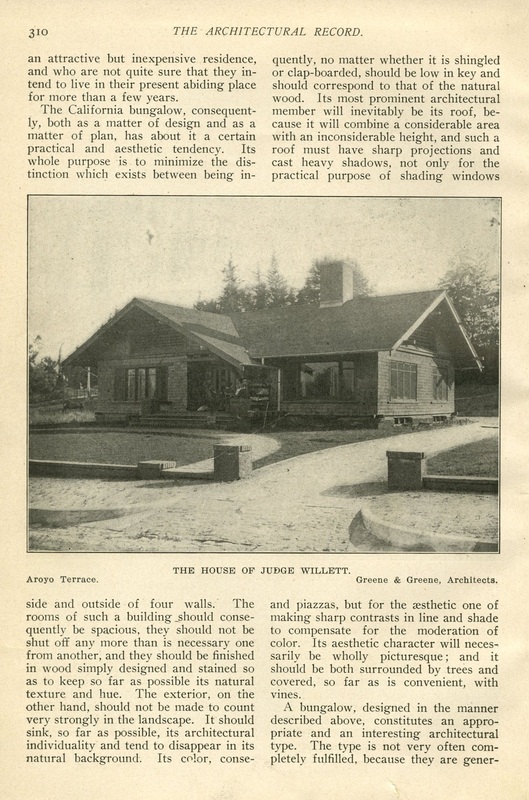 I found the following article in Architectural Record. 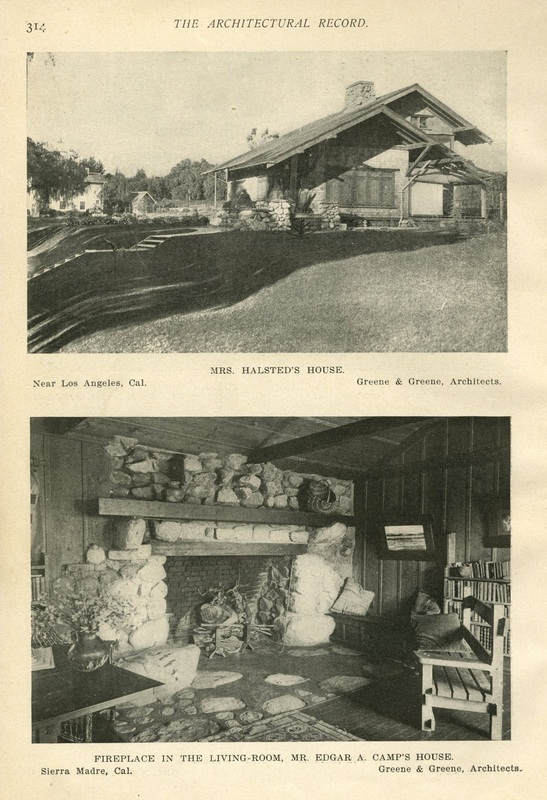 It’s from 1906 which is prior to the building of the Gamble House. Teddy Roosevelt was president when this article appeared! The Titanic hadn’t been built or sunk yet. This last page has the best (ironic) commentary. 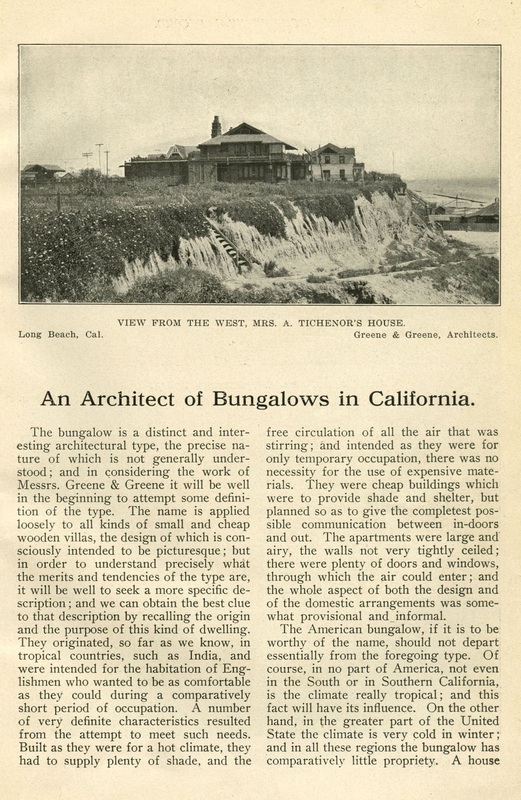 It states that the Gamble’s designs “are not so well adapted to large” houses. 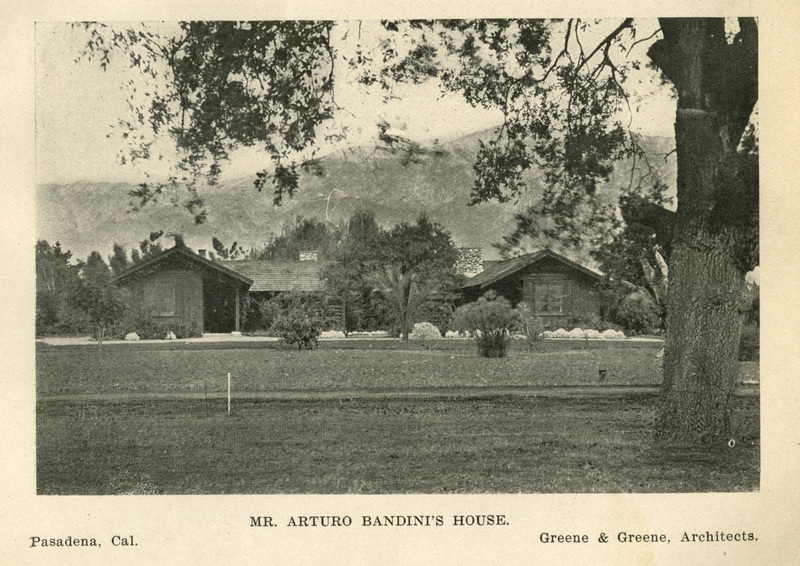 * The interior photo of the Bandini House is from the Greene and Greene book, listed below, which states the photo is courtesy of Mrs. Elliott Bandini. 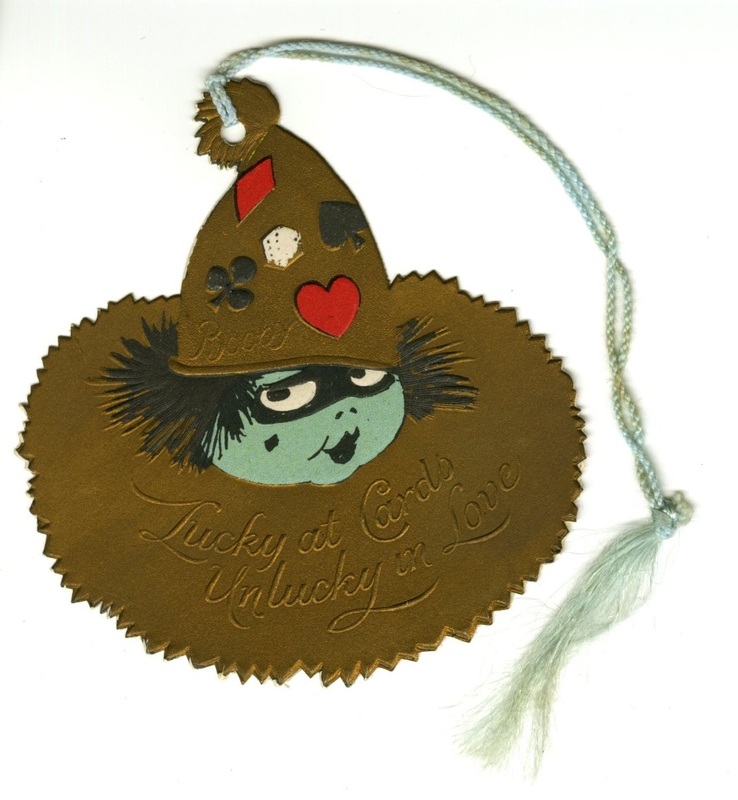 Makinson, R. L. (1977). 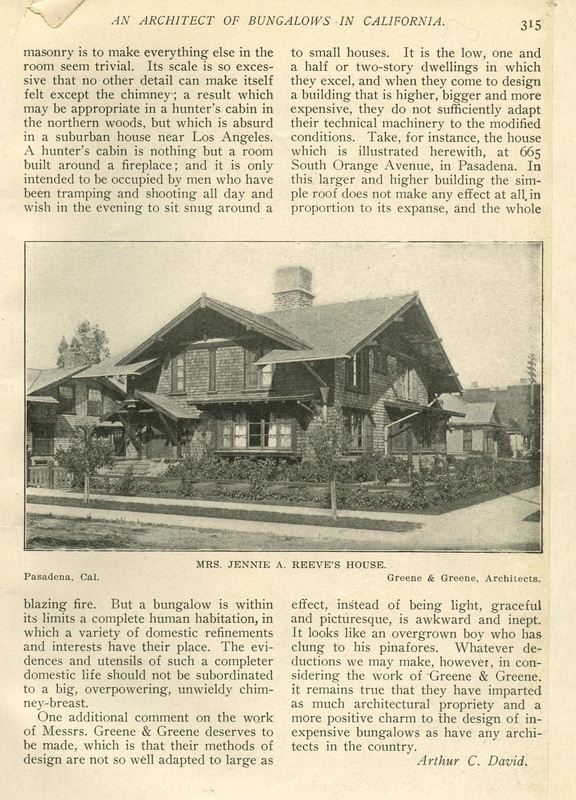 Greene & Greene: architecture as a fine art. Salt Lake City: Peregrine Smith Books. 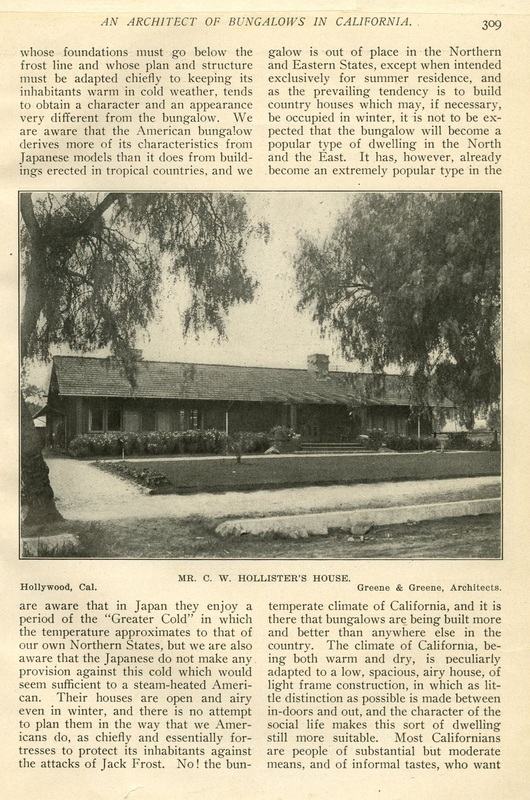 ** The exterior photos of the Bandini House, the Hollister House and the nine page article are from Architectural Record. David, A.C. (1906, Oct.). 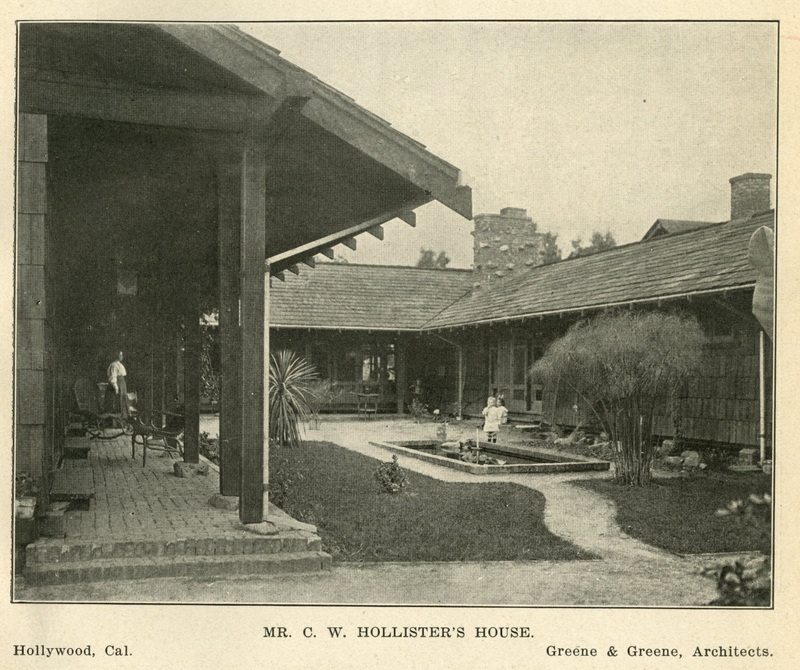 An architect of bungalows in California. 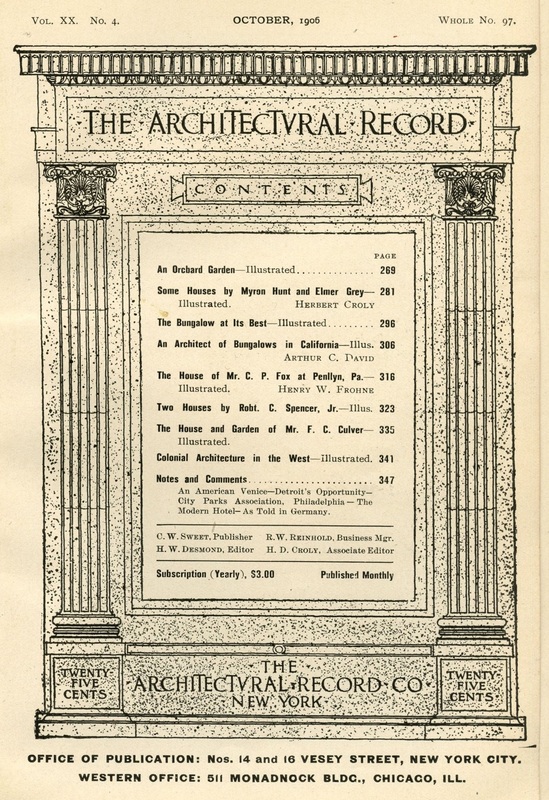 Architectural Record, 20(4), 306-315. 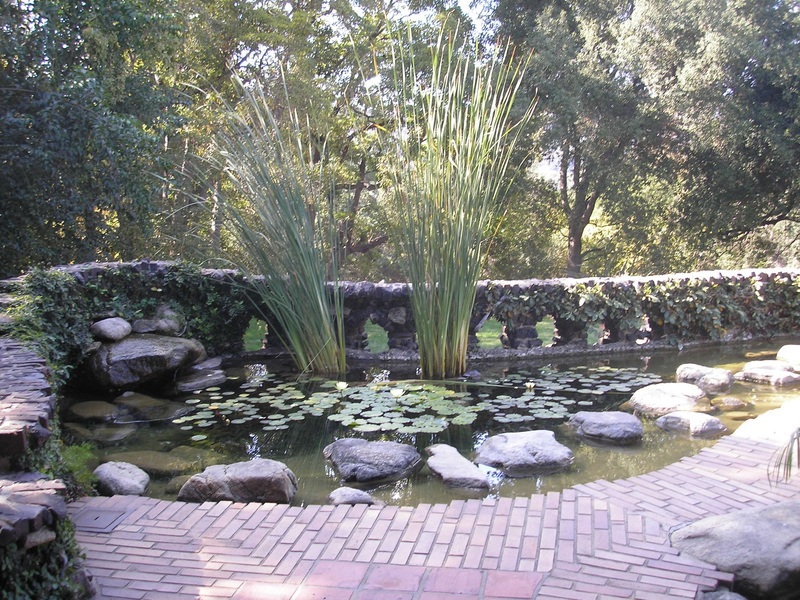 A Pasadena residence. 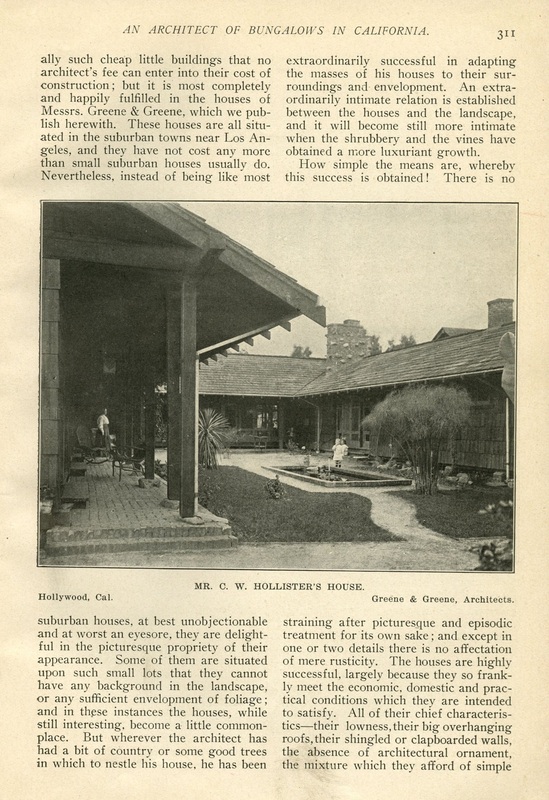 (1917, June). The Architect, 13(6), plate 107.